We’re eating a quinoa salad made with toasted quinoa, fresh zucchini, crisp red bell peppers, fennel, spicy jalapeno slices, cilantro, and blood orange segments tossed with a fresh and zesty blood orange vinaigrette. A: so, just to clarify for everyone who thinks we eat indulgent mac & cheese all the time, we do eat healthy stuff, too!…. sometimes! T: Thank goodness you cook healthy food (sometimes) because I truly eat some of the most unhealthy lunches possible, every single day. I do of course mean, california burritos and carnitas. My heart needs a vacation. A: although we don’t post most of the food we cook, we actually do eat quite a lot of different grains, pretty damn frequently. i just happen to love them all! quinoa, barley, bulgar, you name it, chances are i like it! T: I think quinoa is my favorite of them all. Wait… is rice a grain? A: yup, it is. although you tend to only eat white rice, right? white rice has been through soooo much processing to get rid of the hull, it tends to loose the majority of the nutrition. T: we agree because it’s true. As far as I know quinoa hasn’t really hit the mainstream, but its time will come. It’s too good to let sit on the grocer’s shelf. A: i definately agree it’s too good to sit on the shelf… but it’s definately becoming more and more main stream all the time. shoot, if you can find it in baton rouge, you can probably find people eating it everywhere! T: uhhh… Baton rouge has a population of 700,000 people. T: true… but it would be hard to find it in small towns I’m guessing. T: that’s a great question. Now I have a question for you, Amanda. T: let’s say I live in a town that consists of a hardware store and a “freedom fuel”. A: stop. i don’t care what your question is! my answer is MOVE AWAY! T: well, if everybody moved away from little towns with only a hardware store and a freedom fuel, how would any new cities ever get started, huh? No need to answer that question. Moving on. My original question was, let’s say I live in a tiny town and I can’t get quinoa. Is there another grain I can substitute in that little recipe down below? A: sure, you can pretty much substitue any other grain. just cook the grain according to the package then toss it with the rest of the salad. I would really recommend, though, if you can’t find quinoa, you should try ordering it online. T: good call. So, going back to this particular quinoa salad… I rate it a 4.46/5. I enjoyed the bites of blood orange… that’s not something I eat everyday, but it worked well. I loved the fresh jalapeno, of course. If I could have changed anything I would have added more jalapeno. I’m a fool for some damn fresh jalapeno in salads. A: i really am too. (which if you’ve read my recent salad recipes, you can tell) i’m on a fresh jalapeno craze. T: I’m not on a craze. It’s permanent. A: hmmmm… sometimes i flop between fresh jalapenos and chipotles. whatever it is, i just need the heat. i’m addicted to the spiciness! okay, i give this salad a 3.95/5. it was good. really, it was. but for some reason, it just wasn’t quite as good as the quinoa salads i make with lime vinaigrette. i did particularly like the blood orange segments… perhaps i would add them to a salad made with a lime vinaigrette and it would be shear perfection! T: perhaps. you know, I agree with you. I think I prefer some of your previous quinoa salads to this one. It was still quite good though. A: good…. but no orgasmic mac and cheese! Oh yeah, its really hard to go wrong with quinoa, unless you cook it wrong, or sneeze it out your nose. The Incas knew a thing or two. Here I was thinking that you existed on a diet of hedonistic delights. You’ve inspired me to take a a trip to the healthy side. Also I love your kitchen and the electric cake slice dispenser. I’m pretty sure Quinoa hasn’t hit the main stream here in Conway, AR (Pop. 50,000) But we can get it in the ONE health food store in town. However, blood oranges are nowhere to be found here in hill billy country. thanks, vanessa! i only wish we existed on a diet of hedonistic delights! although i would miss things like quinoa if i only ate rich foods…healthy can be good too! and don’t worry, we’ve since eaten another slightly unhealthy meal which we will be posting soon. regan, at least one store carries quinoa! but no blood oranges?!? that’s sad. although i really don’t remember seeing them in baton rouge either. they grow them out here so we can pretty much get them anywhere. we are definately lucky! tell mike and the kids I said hello! Pretty condom salad! I think I od’d on quinoa at all the peacenik meetings I attended in college. That and burgher wheat. Hi guys! Picked up some blood oranges at an organic farmer’s market yesterday! I love them so much but usually end up juicing them all because blood orange juice is soooooo good! Anyway, haven’t seen any quinoa here but I’ll be ordering some online. I’ve been wanting to try it for a while now and this salad was just the thing to finally make me order some! Is Amanda’s Food Factory the name of a new Saturday morning kids show? And Amanda’s helper in ther Food Factory? Who else but Pepita Brittle!!! another side kick could be Fruit Robot, but that’s a whole other barrel of monkies/monkeys, either primates or the tv band…. sounds like a great dish guys. for those who prefer a ‘gluten’ free diet like i, accept when visiting the local taco shop, quinoa is fabulous and wholesome. just dress it up with some pumps and mmmmm rock it. an interesting fact about quinoa. the Incas apparently held this grain sacred and referred to it as “chisaya mama”. who knew! 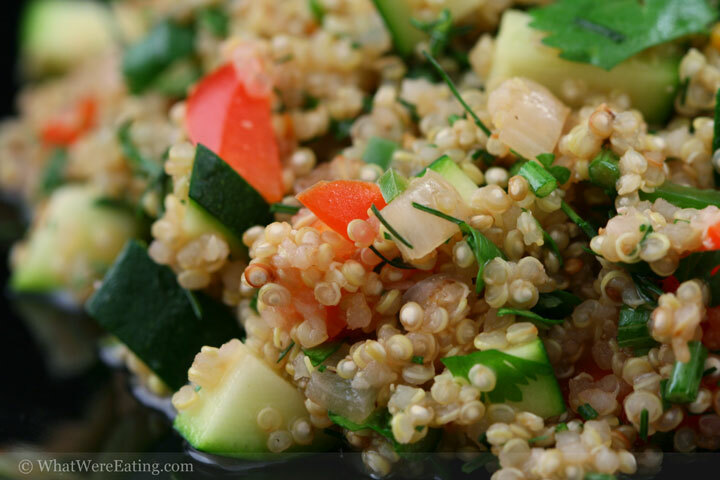 I made your recipe for quinoa salad with thyme lime vinaigrette… Wow. It was spectacular. Great recipe. Thank you! I’m a brazilian girl that eat healthy food too. You’re right. It’s better. Great blog. Loved the quinoa salad. Would I be able to get this recipe for Blood Orange Quinoa Salad?